My son Rodney has a condition called Alport Syndrome. It is a genetic syndrome that causes kidney disease, including renal failure, and can also affect the ears and eyes. Rodney’s biological mother is a carrier of Alport Syndrome. He has two biological brothers, one who had a kidney transplant at 18 years of age, and another who doesn’t have any symptoms of renal failure. He also has a biological sister who is a carrier of Alport Syndrome. From what his doctor explained, Alport Syndrome affects boys more than girls due to its usual inheritance pattern. Alport Syndrome always affects the kidneys. Because of Rodney’s myriad of other health issues, we put off having his kidney biopsied until 2010. The biopsy showed that he indeed did have Alport Syndrome, although he was always presumed to have it, due to his biological mother being a carrier. As Rodney became older, he began to show additional signs of renal failure. The primary symptom is blood in the urine. This is usually microscopic, and we saw a nephrologist and had blood work every six months at first. Then as his protein and creatinine levels became higher, he saw a nephrologist and had blood and urinalysis every three months. His doctor explained that the symptoms of renal failure usually occur by the time the boys are teenagers. Rodney was in Stage 3 renal failure by the time he was 13. Due to his muscle mass being so low, it was almost impossible to tell by his lab levels how much damage was done to his kidneys. Alport Syndrome causes damage to the kidneys by the progressive formation of scar tissue in the normal kidney structures. Hearing loss is another symptom of Alport Syndrome. Rodney’s hearing loss was not present at birth, but became increasingly apparent by about age eight, and occurred before the onset of kidney failure. We are not sure of the full effects of Alport Syndrome on Rodney’s hearing because of his intellectual disabilities. Rodney has severe cataracts and abnormal vision that shows slow progressive deterioration of his eyesight. He has to change his glasses prescription frequently. Due to his intellectual disabilities, his ophthalmologist did an eye exam under sedation, just to be sure of the extent of his deteriorated eyesight and cataract development. Transplant: Give LIFE, Give HOPE, Be an Organ Donor! Rodney started showing signs of kidney failure at about age 11. Some signs for him were not feeling like eating and feeling confused, anxious and restless. We had lab draws every three months and his levels would be all over the place. His medications, including calcium, vitamin B and iron, were constantly adjusted. We also had to give him injections to help with his renal failure induced anemia. Because of Rodney’s intellectual issues and his desire not to have constant medical attention, we chose not to do dialysis but to rather evaluate him for a kidney transplant. He was accepted into a kidney transplant program in April of 2013. In August we saw that his protein levels had doubled and typically the doctor would have put Rodney on dialysis, but this was not an option for us. As Rodney’s health visibly declined before our eyes, we hoped for a donor kidney, but prepared for the possibility that Rodney would not live to have a kidney transplant. Rodney’s nephrologist was in full agreement with us that if Rodney did not receive a donor kidney, he could remain at home and be helped with Hospice. We were called up for a kidney in June 2013, but the kidney was too damaged and we went home to wait. At least five times, Rodney was “on hold” for a kidney, but no kidney became available for him. This is common with kidney transplants. The frustrations of dealing with being on a transplant list were beginning to become very real for our family and friends. Finally, on September 3, we received a middle of the night call to come in for a possible kidney. Rodney was prepped for surgery as if he would receive a kidney, but we didn’t know for sure for more than a day. 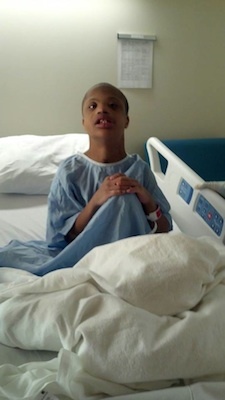 Rodney went immediately into surgery by 11:20am on September 5. The transplanted kidney was placed in the lower portion of his abdomen by 1:20pm. His native kidneys were not removed. The final connections for the kidney and securing the site took until about 4pm. Rodney spent a day in PICU and four days in a transplant step down unit. For the first month, Rodney will have several weekly lab draws and at least weekly medical visits. Medications will be adjusted according to the results of these labs. After about a month, he should be able to come off his three to four anti-infection medications and get less labs and less medical follow-up. Rodney’s body will never accept his new kidney, so he will have to take at least three anti-rejection medications all his life. Alport Syndrome will start to affect the new kidney, but that will be another 18-20 years before he may need another transplant or other decisions made. For now, we have our happy little guy back. Lisa Blackstone is an adoptive mom of three children (two of whom are medically fragile), biological mom of two children and a contributor to Complex Child Magazine and Upstate Parents. She lives with her husband and five children in Upstate South Carolina.